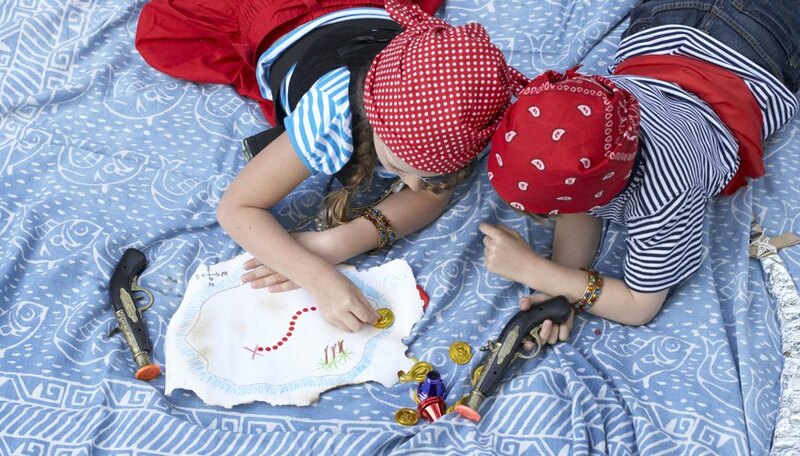 A treasure hunt is a children's game involving a trail of clues that lead through your house and yard to a final reward such as candy or a board game. Each clue-written on a piece of paper-reveals the location of the next clue, until the children reach the end. The game works particularly well with a pirate's theme: Hunting for a buccaneer's hidden treasure by following the clues he left. In order to make it really sing, you should give the clues a nautical or pirate feel. Water clues involve those leading to sinks, birdbaths, bathroom toilets or similar locations. They make great stand-ins for the resting place of your pirate's ship-places where he left important clues as his vessel went down. Try to tell a little story about the circumstances that sunk the pirate ship, while still pointing to practical features about the clue's location. For instance, you could say, "The birds flew down into the wreckage after the cannons blasted our side," which might refer to a birdbath. Or you could write, "The British sent us to Davy Jones in the waters where hot and cold currents flow," which refers to the bathroom sink. Pirate treasure hunts can be made indoors, but the best clues are often found out in the yard, where you can use the landscape to further enhance your story. As with the water clues, you can tailor each phrase to include some aspect of the pirate's tale. Instead of focusing on the ship, however, talk about things that happened to him when he found an island to bury his treasure. For example, "The natives swung down upon us, throwing their spears" could refer to a children's swing set, while "I hid from the mutineers in the hollow of an old tree" could refer to a tree in your yard. If you want to run a pirate treasure hunt, it won't do to simply leave the treasure above ground. Pirates buried theirs, and you should do the same. Find a solid container to keep the treasure-a plastic container, for instance, or a wooden box with sturdy sides-and bury it somewhere relatively easy to dig up. If you have a patch of loose ground in your backyard, that makes a great location. Children's sandboxes are even better, since the kids can dig there without disrupting any nearby flower beds. If you go this route, include some plastic shovels with the final clue so your little buccaneers won’t get their hands dirty. You should also bury the treasure next to a recognizable landmark, such as a tree or a garden gnome, so they know where to dig.